Why Are We Optimizing Our Roth Contributions Now? My wife and I have a goal of paying $0 in federal taxes this year. There is nothing illegal about it. We are not trying to cheat the system. Instead, we are trying to optimize how we earn our income and where it all ends up by using current tax laws. Our goal is to keep as much of that income as possible … so we can put it to work for us growing our net worth and earning additional income from it. There are several tools and strategies available to us to help optimize our taxes. But the main goal is to lower our taxable income so that it is not taxed or is taxed very little. Note – At this point in time, 100% of our income comes from a W2 and dividend income. We can lower our taxable income several different ways including payroll deductions like medical, dental, and vision insurance at my job. I have money that goes to a pension every month that is taken out of my check pre-tax. We opened a 457b retirement account through my employer … which deducts funds on a pre-tax basis. All of those payroll deductions help to lower our taxable income. There are other tools (outside payroll deductions) that can help lower the income we are taxed on. For example, my wife and I could contribute to a traditional IRA … assuming we meet the criteria. Contributions to an IRA would help to lower our taxable income … and possibly lower the taxes we need to pay. If my wife and I each contributed the maximum allowed amount ($5,500 per person) to an IRA this year, we could potentially reduce our taxable income by $11,000. At the beginning of this year … that was going to be our tax optimization strategy. However, once we started to calculate some of the numbers … we realized a Roth IRA may be the better option for both of us. A Roth IRA is an IRA, but with a few differences. For our family, the biggest difference is that contributions made to a Roth IRA cannot be used to lower our taxable income. But the good news is that unlike a traditional IRA, qualified distributions are tax-free when you take them out. So with a traditional IRA, your money is taxed when it is taken out … whereas for a Roth IRA the money is taxed before it goes in. Here are the differences of a Roth IRA compared to a traditional IRA. For additional information on these types of retirement plans, check out the Roth IRA information found on the IRS site. Is a Roth IRA the Preferred Retirement Account? When you look at the overall differences between the retirement accounts listed above, it would seem like the Roth IRA should be the preferred tool for anyone in the financial independence community. The biggest downside to the Roth is that contributions cannot be used to lower your taxable income. 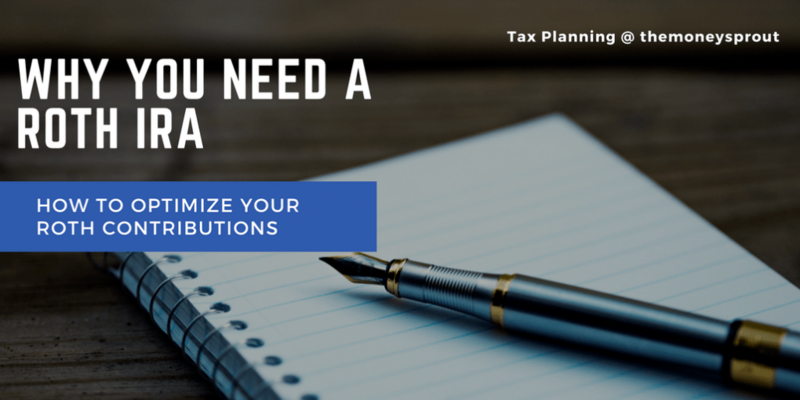 So if you are trying to get your taxable income down below a certain threshold, then you wouldn’t be able to leverage your IRA contributions. That has been my biggest hangup with investing in a Roth IRA because in the past, we wanted to reduce our taxable income. So the majority of our investments were made in tax-deferred accounts like IRA, 457b, 401k, and 403b accounts through various employers. By leveraging these tax deferred accounts, we were able to keep our taxable income lower. But wouldn’t it be awesome to take the best of both world’s when it comes to retirement savings? Being able to put money into a Roth account and still keep your taxable income low would be the perfect scenario. Well with the passing of the recent Tax Cuts and Jobs Act, we may be able to put money into a Roth account … and not worry about our taxable income. I recently calculated our FREE Money for 2018, based on the deductions and credits we are now eligible for starting this year. Based on the results, it appears we have several options available to us that can help optimize our taxes and future retirement funds. For more information on calculating your FREE Money, I suggest you check out the following article – Tax Planning: 2018 Free Money by the Millionaire Educator. To quickly summarize, “free money” is that amount of your income the government allows you to earn in a given year before it starts taking taxes out. One of the huge benefits of calculating your free money … is that you can then optimize your finances to fit your situation. For example, based on the Tax Cuts and Jobs Act I was able to calculate our free money at $77,175 for 2018. That means if our adjusted gross income (AGI) is below that amount, we won’t pay federal taxes this year. Considering our taxable income the past couple of years was below that $77,175 threshold, there is a very good chance it will be again this year. Plus I have started putting away a good portion of each paycheck into a 457b plan at work. That will help to keep our adjusted gross income below our free money mark. So you may be wondering what does a Roth IRA have to do with FREE Money? Well, I am glad that you asked. My wife and I had been planning to open a traditional spousal IRA account up in her name this year. Initially, we wanted to try and start filling up more of our retirement buckets with as much of our income as possible. And even though my wife does not work, she is eligible to open up a non-working spouse IRA … because we file our taxes as “married filing jointly”. Unfortunately, for many years we were not as optimized as we could have been when it comes to our taxes. Instead of filling up all our available retirement buckets full of income, we missed out on things like IRA’s. We still had our retirement accounts sponsored through employers and our taxable brokerage accounts. So we decided to set a goal to pay no federal taxes in 2018 … by leveraging investment plans at my work and separate IRA’s for each of us. I have a rollover IRA and my wife does not have any … so the logical first step was to open an account in her name. After calculating our free money for 2018 (which is $77,175), I realized that we can open a spousal Roth IRA account in my wife’s name instead of going the traditional IRA path. But I thought you said you needed to use the IRA contributions to lower your taxable income? Well, last year that would have been a logical solution to keep our taxes low. But with all the different deductions and credits we can take in 2018 … we don’t necessarily need to lower our income. Based on a few back of the envelope calculations … we won’t need to lower our taxable income by $5,500 to pay $0 in federal taxes. We have a much higher ceiling this year to stay under. So what value would we have of putting more of our income into a traditional IRA and eventually pay taxes on it? Instead we can open a Roth IRA for my wife and contribute the $5,500 maximum … which is not deductible. But it doesn’t really matter in our situation. What does matter is that by putting those dollars into a Roth account … we won’t have to pay taxes on it when it comes back out years down the road! The same cannot be said for those funds going into a traditional IRA or our 401k dollars. I am so pumped about this that I think we can even squeeze another $5,500 out of our paycheck to put into my Roth IRA that was setup years ago. Last year, I simply put any extra dollars we had into my traditional IRA. I will run some more calculations so that we can get as close to our FREE Money limit as possible. For years (actually decades), I never cared much about optimizing our taxes. Honestly, I didn’t even know it was a “thing” until about 6 months ago. Of course, I knew that keeping our taxable income lower meant lower taxes. But I didn’t know it was possible to lower that tax bill down to almost $0. Late last year I finally woke up and realized I needed to pay more attention to our income and how it was being taxed. At the time (in 2017), it made sense to put our savings into tax-deferred accounts like a traditional IRA or 457 employer account. Those steps allowed us to lower our taxable income so that we will end up paying fewer taxes. But this year is different. We are taking the steps to optimize our Roth contributions now based on current tax law … so that we can reduce our tax liabilities in the future. Are you optimizing your current and future taxes based on the recent tax changes? What strategies are you taking?